Not all letterpress is equal (≠). 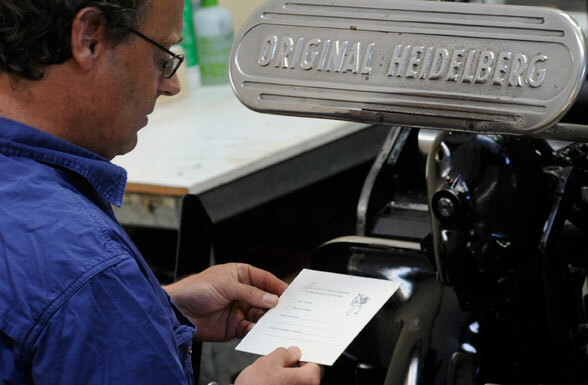 Many letterpress printers often mention “quality” when referring to their printing. Understandably, clients are sometimes confused (or misled) that using the letterpress process is instantly going to equate to good quality – purely because of its craft appeal. In the 15+ years we’ve dedicated to letterpress, we’ve heard all kinds of “craft-based” excuses for sub-quality work. The popular one being “because letterpress is a craft, every piece will be slightly different and its imperfections make it special”. This may be the case for less skilled printers but the reality is you’re paying for a prestige process, so shouldn’t you be getting prestige results on every printed piece? After all, who on your guest list would you give the less than perfect invitation to? True letterpress quality is not subjective. It’s the result of real experience through all stages of the process, a thorough knowledge of the materials and importantly, the skill in being able to apply the experience and knowledge on the press to produce the desired result. At The Artisan Press we pride ourselves on making our experience, knowledge and skill available to you, the client, at every step of the process. This helps you to make informed and vital decisions.